Piotr Ciąćka as a member of the prof. Wojtkowski team took part in a few working visits at the Nicholas Copernicus University. First visit was concerning the measurements of pupillary light reflex in response to strong infra-red light perceived by the human eye due to two-photon absorption process. The scheme of the experiments to be performed on an existing two-photon scanning light ophthalmoscope was established. The team performed preliminary tests to work out the changes in the setup needed to perform reliable measurements. Necessary tasks, such as providing stimulus synchronization with camera frames, devising an optimal path for the galvo scanner, etc., were assigned to the research team members. Next working visit was a continuation of previous studies. Piotr Ciąćka provided an optimal raster for galvo scanners allowing the increase in the angular size of the stimulus. Together with team members, they debugged the experiment control software and made some changes to the setup in order to improve contrast of iris images. They performed the series of experiments and recorded the changes in pupil size upon two photon excitation. First results are encouraging, but further work needs to be done to reject unwanted pupil contractions not resulting from the stimulus and to improve the iris illumination scheme. 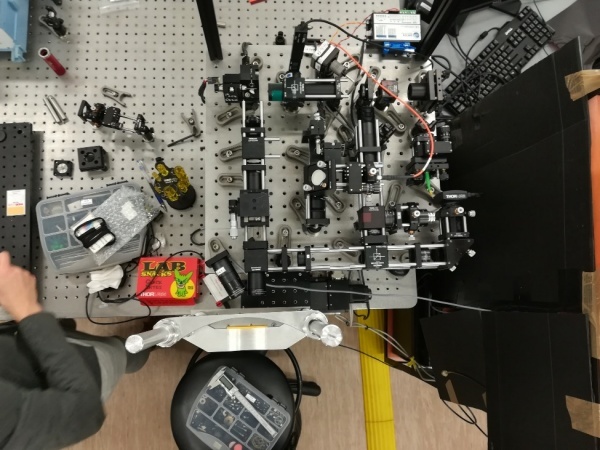 The next short visit was continued of setup refinement and measurements of the pupillary light reflex in response to strong infra-red light (perceived by the human eye due to two-photon absorption process).